All prices incl. VAT. - This test is recommended for use in court or a youth welfare office. Paternity testing will take 4 working days. The results will be send by postal mail. Need the results faster? Order our "over-night-express" service. The result will either confirm paternity with 99,99% probability or exclude paternity 100%. You will receive your test results in a written report. Due to our laboratory’s certifications and your obligation to have a witnessed sampling the results shown in our DNA reports are accepted for legal purposes as well as for Youth Welfare Organisations. 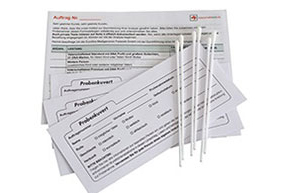 According to the German Gene Diagnostics (GenDG) law persons who want to perform a DNA test need to have a witnessed sampling. Each participant must supply a proof of identity and the witness provides chain of custody for the collected samples. Having the mother submit her samples along with the child and alleged father helps us to establish an even more conclusive test result. That is why we strongly encourage the mother to participate in the paternity test. 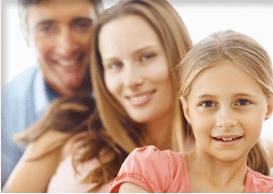 With Eurofins, the mother’s samples are tested free of charge with every paternity test. If the mother does not provide her samples for an analysis she will still need to give her written consent for the DNA analysis of a child under age.